While it’s naturally still fairly early in the game to begin projecting how the 2015 NFL season will play out, just a couple of weeks past the draft, the folks at ESPN Insider have taken a crack at it. 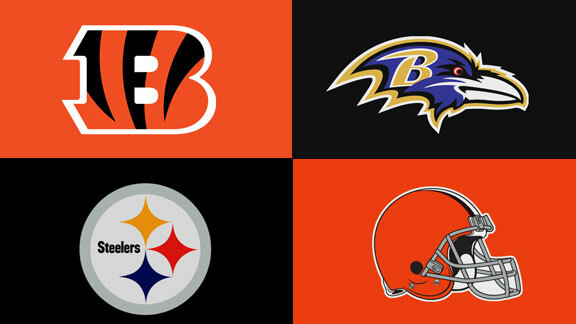 Aaron Schatz of Football Outsiders has broken down projected win-loss records for every team in the league, and he sees the entire AFC North being slotted down a peg this year after sending three teams to the postseason in 2014, although the only playoff win between the three of them came between two division opponents. Last year, of course, the Pittsburgh Steelers won the division by virtue of posting a record of 11-5, their best finish since the 2011 season, finishing off the season on a four-game win streak. By virtue of a tie, the Cincinnati Bengals placed second with a record of 10-5-1, with the Baltimore Ravens just behind at 10-6. After keeping pace for much of the season, the Cleveland Browns bottomed out at the end of the year to finish at 7-9. Schatz expects all of this to get worse in 2015, in large part because the AFC North played the AFC South and NFC South last season, which featured a lot of teams picking high in the first round a couple weeks back. Of course, the Steelers’ losses were represented well there, having lost to two teams from the NFC South. In fact, four of their five losses came against teams who posted losing records last season, with only the Ravens finishing above .500. But I digress. Schatz has the Ravens finishing atop the division this year with a record of 9-7. The Steelers and Bengals both finish 8-8, but Pittburgh wins the second seed by virtue of strength of schedule, and the Browns sink even deep, back to double-digit losses with a record of 5-11. While the Steelers may be facing one of the hardest schedules on paper this season, we know that those things can change easily, even on a week-to-week basis. The season opener against the New England Patriots certainly looks much different without Tom Brady, for example. Schatz acknowledges that despite the easier schedule last year, both the Ravens and Steelers charted well in their defense-adjusted value over average metric, in which they finished fifth and eighth, respectively. The Steelers’ figures were lopsided, however, with the offense charting second and the defense 30th. Schatz also predicts that the AFC North will face more injuries this season, as they stayed healthier than average last year. It’s certainly true that, for most of the year, the Steelers were fortunate to stay as healthy as they did on the offensive side of the ball. In all, the breakdown sees the Miami Dolphins as the number one seed in the AFC this year at 11-5, with each other AFC division winner finishing 10-6 or worse. The Denver Broncos earn the second seed over the Indianapolis Colts via strength of schedule, while the Ravens are the only North team to make it to the playoffs. The two wildcard teams to emerge are the Patriots and the San Diego Chargers.